The river wound around the edge of a golf course, providing a boundary between the primped greens and fairways and the much more democratic municipality of Pitshanger Park. I followed its course as closely as I could here, remembering how tricky it had been to walk alongside the river further upstream. The scrubby fields between the road and the park were deserted except for a lone dog walker who patrolled the perimeter, eyeing me with a little suspicion as I trudged carefully around some of the wetter spots on the path. 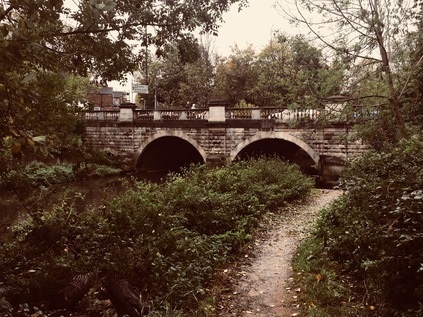 The river turned west, and I needed to retreat to the roads to find it again, doing so via an inelegant clamber over a stile and into the attractive and quiet streets of Brentham Garden Suburb. This rather sleepy and at first unremarkable estate is in fact an early example of a cooperative housing development built to incorporate Ebeneezer Howard's principles as outlined in 'To-morrow: A Peaceful Path to Real Reform'. Published in 1898, this work kickstarted the Garden City movement which suggested the possibility of enjoying the conveniences of city life in almost rural settings. With construction beginning in 1901, Brentham pre-dates its better known and now rather exclusive cousin at Hampstead by some years but being a little further out of the city, isn't perhaps well positioned to become the haunt of the well-to-do and famous. 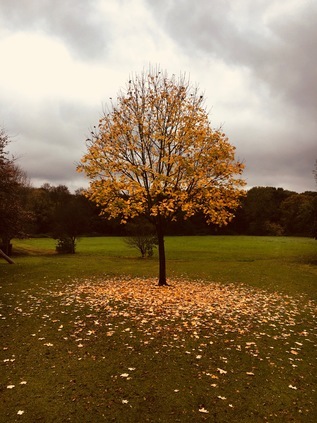 Walking west, towards an entrance to Pitshanger Park, I watched the estate waking up - supermarket delivery vans puttered between streets, families wandered outdoors, wrapped in winter clothes. The rain had almost stopped as I turned into the park entrance which was guarded by a gang of gossiping dog walkers, their bored hounds grunting and sniffing at the floor in anticipation of their excursion recommencing. I set off across the park to its northern boundary where the river was hidden behind a line of trees. There were few others in this part of the park away from the sports club and café, and while still a little damp my walk was quiet and pleasant. At the edge of the park I turned north along a narrow hedge-lined alleyway cutting through the golf course. The river, after being joined by what appeared to be the stub of a forgotten tributary or former diversion, also turned north, and through the hedge I could see it winding between greens and fairways, providing a genuine challenge to errant golfers. The path divided near a wooden bridge over the Brent, marking the point where I'd expected to enter the park had my excursion through the fields not proved viable. I turned west again, rejoining the river as it took a broad loop to the south and then north along Argyle Road. A detour here took me close to the riverbank as far as Perivale Lane where I feared I was trespassing on the grounds of St. Benedict's School. I tramped back to Argyle Lane, retracing my steps rather than following an arc around the playing fields of a leisure centre which, while closer to the river were clearly muddy and very wet and offered no clue about how I'd escape at the other end. I began to fear that perhaps the Brent was to be as elusive today as it had been on the first part of my walk in from Finchley. I headed west along Ruislip Road East, a long straight route running directly from Ealing to Greenford which the borough had recently improved to favour walkers and cyclists. Frequent banners hung from the fence behind which the river ran, informing me how this five-mile long route was safe, well provided with frequent crossings and speed controls and could enhance my health and wellbeing. Indeed there did seem to be a fair number of people wandering back and forth as I passed under the railway line from Greenford with the Brent churning darkly under the adjacent arch of the bridge. The road began to rise towards a junction with Greenford Broadway, crossing the river by way of an ornate bridge. Beside the bridge a gap in the fence provided a surprisingly anonymous entrance to the continuation of the Capital Ring walking route. I'm still asked fairly often if I'm 'doing' this walk - and equally often I'm told how unattractive and borderline dangerous my questioners found the walk. At this point I'm forced to grit my teeth and suggest that I'm not walking the route but inevitably I'm encountering parts of it on my travels. I'd love to add that circling a vast, complex city like London is bound to take a walker through a variety of landscapes which make up the edgelands, but I suspect they're already busily ticking off their next sanctioned and sanitised walk somewhere. After a brief pause to buy lunch I returned to the inconsequential gap in the fence and plunged into the cool, quiet tunnel between the trees which lined the river here. Near the road there was the usual evidence of temporary occupation: blue carrier bags, Polish lager cans, the marks of extinguished fires and discarded clothing - but soon these petered out too, and it was just me and the river. 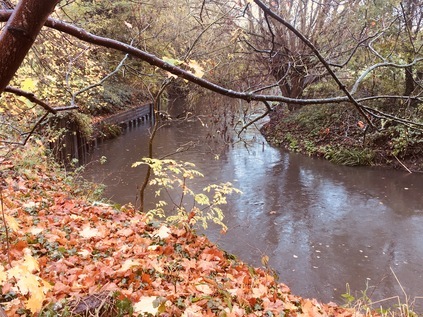 The Brent was wide and fast-flowing here, swirling with rainwater from the numerous streams and gullies which joined it on its suburban journey. This wedge of parkland, hemmed in by a recycling centre and a large development of inter-war housing was almost entirely deserted. The sky churned overhead, but promised brighter conditions might be coming later, and I happily trudged south, the river tumbling and twisting beside me. The way was marked by infrequent wayfinding posts, and one of these sent me down a flight of wooden steps cut into the steep valley side and onto a rarely walked diversion on the bank of the river. Unsure if this path would safely return me to my route without a muddy scramble, I was a little uneasy about heading onwards - but the lure of the water was strong and I'm glad I continued. This was the closest I'd managed to get to the Brent so far, and it felt good to be walking beside it more directly for a short spell as it cascaded over a weir and swirled around hanging boughs of trees which leaned down into its surface. Returning safely to the path further ahead, I crossed a bridge and found myself on a comparatively well-made stony path passing directly through another golf course, marked by signs warning me that by passing them I accepted the risk of encountering low-flying balls. There were few golfers braving the unpredictable November weather today, so I gladly took the chance and continued. The river was to the east now, denoted by a snaking line of trees beyond the flags and bunkers, and I once again wondered how much more of it I'd manage to see? Above the trees, the steeple of St. Mary's Church in Hanwell was a black silhouette on a turbulent and dramatic sky which seemed to shift to dominate the view from every direction as the path turned with the river. There has been a place of worship here for well over a thousand years, and it struck me that the development of parks and golf courses around it meant that it still provided a landmark from some distance away with little encroachment by other tall buildings. The path rejoined the Brent, crossing it by way of a solid but scruffy metal bridge, and then divided again - the more formal sandy track leading up to the church while a series of wooden flets sunk into the muddy bank took the path into a broad meadow and towards the curve of the river again. I chose the muddier path and stayed with the Brent. At the top of the steps I found an expansive park, surrounding the fences of Hanwell Zoo and allowing me to take a wet but relatively mud-free excursion along the riverbank as it wandered east around the edge of the Millennium Maze and into Churchfields Recreation Ground. The thunder of trains could be heard over the chatter of children and braying of goats, apparently the only animals braving the wet weekend morning in a compound at the back of the zoo. It occurred to me that I'd soon be passing under the Great Western Railway which had brought me into Paddington a few hours ago, the twists and recursions of today's journey echoing the contortions of the Brent. Now though, the river slunk quietly in a low gully at the foot of the park, screened by high trees and hedges which hid the graceful arches of Wharncliffe Viaduct from view until at the foot of the sloping parkland one of the great arches leapt into view, gracefully crossing the path and the river. This awe-inspiring structure was one of the earliest projects attributed to Isambard Kingdom Brunel, and also one of the first completed along the route west from Paddington to Bristol with trains running above from 1838. The viaduct also has the honour of being one of the first buildings 'listed' for preservation in 1949, and such forms a key part of the bid to have the whole original GWR route named a World Heritage Site. While it remains unclear if Queen Victoria really did insist the Royal Train pause on the viaduct to let her enjoy the view along the Brent Valley, there are now others who linger here - namely a vast colony of bats which live within the hollow archways. The river turns south again here, initially in a brick culvert which neatly brings it alongside the path and under one of the easternmost arches of the viaduct. Looking along the structure, its grace and scale are overwhelming, and perhaps not fully appreciated until viewed from the hay meadow to the south of the line where Lord Wharncliffe's family arms are visible on the central span - recognition of his support for the parliamentary bill authorising the Great Western Railway. I paused here, trying to get a picture which would truly show the sweep of the arches over the valley, an amused dog walker letting his charge scamper in the long grass while he watched me struggling to frame the shot against a dull grey sky. Behind me as I faced the wonder of Victorian engineering, another impressive bulk of a different era loomed: the huge Ealing Hospital - a solid grey block raised above a wide pediment, with ramps leaping and curving from the ground to deliver ambulances direct to the entrances. I'd passed this way countless times, spotting the rather grim building from trains speeding west from Paddington, but up close the building felt impressive, dour and overbearing. Before reaching the Hospital, the river needed to pass under the Uxbridge Road via a low stone bridge. There was a choice of routes here - the path ascended to cross the busy road at grade, or I could stay beside the river and pass under an arch in the bridge built to accommodate the footpath. This passage dipped low, close to the river's edge and appeared worryingly waterlogged. I weighed up the alternative route up to the road, but decided that I was brave enough to attempt the slither down the stone slope and under the bridge. In the edge of the river beside me, a forlorn and slowly moulding office chair was marooned in a shallow pool of greenish water. The roof was close to my head, stippled with drips of calcification and dangling here and there with more ambitious stalactites, but the passage was uneventful save for paddling through an inch or so of water - either rainfall or overspill from the Brent which felt perilously close. The path climbed again, rising to pass close to the eastern perimeter of the Hospital, revealing the inner workings and complexities of the building, rather spoiling the illusion of the futuristic swooping concrete ramps and the rather inhuman face of the tall concrete blocks. Built in 1979, the site fills the nook between the River Brent and the mainline of the Grand Junction - latterly the Grand Union - Canal. To the west of the current hospital the former Middlesex County Asylum, opened in 1831 remains in use as a modern psychiatric unit, still sequestered behind a solid red-brick wall. Known for some time as St. Bernard's Hospital, the facility pioneered early forms of occupational therapy under Dr William Ellis its first superintendent, and was later instrumental in the removal of restraints in favour of less invasive means of protecting patients, including the padded room. The relative humanity of the regime at Hanwell under Ellis is evident in his principled resignation upon learning that the Commissioners and Justices wished to cram more patients than he felt could be properly be cared for. This corner of Hanwell also holds a significant place in the nation's industrial history. Beyond the hospital the path divided, with a spur leading up to the towpath of the canal at the bottom of the Hanwell Flight - a series of six locks with associated balancing ponds built in 1794 to bring the Grand Junction to the level of the Brent, with which it merges nearby. As I emerged beside the bottom of the flight, two young couples were beginning the ascent of the flight, enjoying the sunshine which had finally escaped weakly from the cover of low cloud and not yet tired from, or perhaps fully cognisant of, the effort required in operating the six locks to raise their boat through fifty-three feet. I was tempted to follow the canal but I stuck with the river path as long as I could, taking the path which shadowed its last sluggish twists between the cottages on Green Lane and the canal, before finally reaching the junction under a brick bridge. From here I would be walking the southern part of a route which was navigable to Birmingham and beyond, and which had revolutionised transport in the 18th century. The River Brent, for a time at least, was subsumed into the wide, businesslike line of the canal - but it wasn't entirely absent. The river's meanders and twists as it approached the Thames largely dictated the course of the canal. Where the meanders were too tight and wide the river branched from the canal into foliage-choked and litter strewn loops which tumbled busily over weirs while the canal took a more sedate route through the wide green spaces of Osterley Park. The grand house here has its origins in an Elizabethan Manor which, at a respectable distance from London attracted the Child's, a well-connected banking family who in 1761 engaged Robert Adam to rebuild the house which was by then in considerable disrepair. Osterley House was once set in open countryside, and while its immediate grounds remain a park in National Trust management, a surprisingly large area of apparently unmanaged open land which would once have been part of its substantial grounds shadows the Brent here. To the east of the river this has become a managed wildlife area, part of the chain of spaces which make up Brent River Park. To the west the former Great Western Railway branch to Brentford runs broadly in parallel, passing the curiously named Trumpers' Crossing nearby. On the towpath, a large sign notes the location of the prize-winning length of pile in the 1959 Kerr Cup Pile Driving Competition. This contest, apparently organised by British Waterways, appears lost to history - even Google largely drawing a blank except for references to the sign itself. Both canal and railway pass under a more modern transport innovation here too, with the M4 sweeping above on a curving route into West London via a practical and unadorned concrete and iron overbridge. The traffic shuddered and screeched above, the notoriously bottlenecked road seemingly flowing freely for a welcome change. For a while, the motorway, railway and canal ran in parallel along the broad lower Brent valley. The river meandered to the east here, passing around large wooded islands under the road, traffic above seeing a carpet of treetops below and largely unaware of the presence of the waterways. The towpath climbed over the river by way of an elegant iron bridge spanning solid, brick piers. Beyond the fence the silent machinery of a waste transfer station waited restlessly for the next load of detritus from the suburbs. This was once Brentford Town station on the somewhat unloved Brentford Dock branch, Brunel's final railway project before his death. The aim was to secure a GWR connection to the tidal Thames at Brentford - but the line struggled from the start with objections to its construction raised by the Grand Junction Canal Company and the Duke of Northumberland, owner of nearby Syon House. When eventually opened to goods in 1859, and then to passengers in 1860, the initially single track, broad gauge line failed to deliver on its promise in attracting commuters. The anticipated passenger flows to the Dock for ferries to Kew Gardens didn't ever begin operation, but freight traffic grew steadily with cargoes transferred to barges at the busy docks beside the Thames. By the time services were suspended as an economy measure during the First World War the branch was operating as a more conventional double track spur from Southall - but passenger traffic was never strong, in part because the connection to the mainline faced west making through-trains from Paddington unworkable. The London & South Western Railway had arrived in Brentford in 1849 with swift services direct to Waterloo - and the GWR simply couldn't compete. Despite restoration after hostilities ceased, the service was reduced to a peak time shuttle in 1929 and ceased entirely in 1942. Perhaps surprisingly, freight traffic continued to the goods depot at the Town Station site until 1970, with private sidings serving Firestone and other factories along the 'Golden Mile' of the Great West Road - the great mid-century sprawl of industry out to the west of London. Now the line stops short of its former crossing of the A4 while the collected waste of Hounslow, Ealing and Richmond is sifted and containerised at the railhead. Soon after passing under the road near the vast mirror of the Glaxo Smithkline global HQ, the river is bridged by the L&SWR's 'Hounslow Loop' - and with electric trains passing frequently above it's perhaps easy to see why the Great Western's branch never quite made its mark as a passenger railway. I emerged from beneath the Great West Road to find the hulking remains of an overhanging warehouse leering out into the waterway. It appeared that boats awaiting repair were now stored here, somewhat sheltered by the structure which seemed to be in the midst of a long process of overhaul. The path edged around the skeletal building, feeling oddly unofficial - this area was in the throes of redevelopment with the walkway temporarily transferred onto an unnerving floating pontoon in the canal. I trudged carefully along the queasily oscillating plastic walkway, noting the modern apartments which had encroached on the broad canal as it approached Brentford Gauging Lock. Walking here felt like trespass, and I wasn't sorry to emerge on Brentford High Street which felt down-to-earth in comparison to the eerily quiet developments along the canal. Brentford High Street was surprisingly quiet too, with the Great West Road now taking the strain of much of the through traffic. At this, western end of town things were starting to feel the effort of gentrification - pubs were smartening up and a few specialist stores opening opposite a modern hotel building on the edge of the Canal basin. 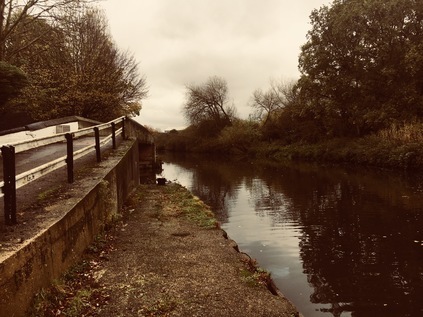 The towpath continued, descending via a slick, steep flight of stairs onto a narrow ledge which turned east along the Brent's final meander towards the Thames. This part of the walk had looked straightforward from the maps - a last trudge along the path to the confluence - but it was a surprisingly complicated endeavour. Firstly, the path was confusingly discontinuous and was often thrown aside from the water by private stretches of mooring. At one point following the path necessitated clambering up onto a concrete ledge to cross the river frontage of a timber merchant's warehouse which would formerly have received deliveries by barge. There were few people around and sparse signage to indicate I wasn't way off track - making the narrow and unclear right-of-way feel strangely menacing. The afternoon was becoming warm too, with the morning's mist and rain now a memory as the sun beat down on the water, reflecting dizzily back at me. I crossed the river again near a muddy inlet which reminded me that the River had now taken precedence again, and that this was Brentford Creek rather than the managed route of the canal. Immediately after crossing the bridge the route descended a steep staircase down to the grassy riverbank, as the more solid walkway through the Brentford Dock Estate remained private. Design of this development of homes by GLC architect Sir Roger Walters began on the closure of the docks in 1964, and building was finally complete by 1978 - the year of his retirement. Originally proposed for social letting, only around one fifth of the units were rented with leases for the rest sold by the GLC, resulting in the privately managed estate of today. In 1980 the associated Marina development was opened by the flamboyant GLC leader Sir Horace Cutler arriving by boat from County Hall. Cutler was by all accounts very keen on such showmanship, and although his administration is regarded as largely unsuccessful, he raised ideas which later found more general acceptance - not least the extension of the Jubilee Line into Docklands to spark regeneration, the promotion of the London Marathon and an audacious scheme to bid for the 1988 Olympic Games - which failed to find Government support. Cutler also correctly predicted that if elected, the Labour leader Andrew McIntosh would be ousted by the left of the party and that Ken Livingstone would become GLC leader. However, fighting the election on this negative basis seems to have assured Labour of the very victory which Cutler feared. Six years after Cutler's triumphant arrival stunt at Brentford Marina, the GLC which he had himself described as "too big, remote and shadowy" was finally abolished by the Thatcher government, nominally for those same reasons. I crossed the Brent for the final time at Thames Lock - the tidal gates which controlled entry to the docks until their closure, and which still allow experienced boaters to access the Thames at designated times. The area around the lock was a pleasantly haphazard zone of chandler's yards and crumbling warehouses which transported me with a jolt to the unreconstructed reaches of the Lower Lea Valley more than a decade ago. Boats of all kinds were visible, some floating queasily askance, others hoisted from the water and in various states of repair or decay, but no-one seemed in a hurry to do much this sunny, Saturday afternoon. Here too, regeneration was slowly encroaching - and the people who I met crossing the bridge over the last loop of the river were upwardly mobile, young and optimistic looking types. Dock Road led down towards Brentford High Street which was a confusing and somewhat downbeat mix of buildings awaiting demolition, new developments and tired looking blocks from the late 20th century. A little further east I found the signposts marking the route to the Thames Path. Here, like some of the places I'd encountered the path in the east of the city, there were discontinuities and complex diversions where the riverfront rights of way hadn't yet been resolved. A short way ahead I found an alleyway which returned me to the final few metres of the River Brent at Point Wharf Lane beside some tidy and well-used residential moorings and some shiny newly built apartments stacked atop a trio of Turkish, Indian and Italian restaurants. The last mile of the Brent had been quiet and residential, and felt curiously private in nature. The river belonged to those who lived beside it and I felt like an intruder walking the path beside their homes. As the path turned east, I realised that I'd unexpectedly reached the point of confluence - and I tried to snap a picture inconspicuously over the heads a family working on their boat. 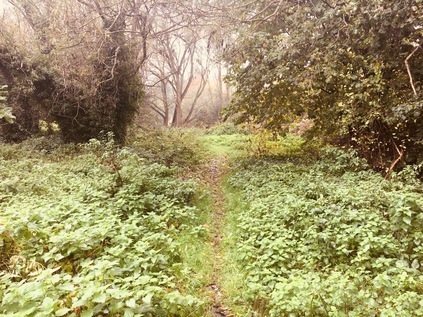 I also calculated that the walk from Perivale to this spot had in fact been around ten miles in length - there was certainly no way I'd have finished this walk on my last outing, and perhaps I'd been too tough on myself for not pressing on to Brentford. after all? My estimate, minus the winding and curving of the river, had been dramatically off beam. Now I needed to head briefly back inland near the giant stainless steel swoop of Simon Packard's 'Liquidity' sculpture - a commission which had almost broken the spirit of the artist - standing resolutely on the quayside at Ferry Lane despite local homeowner's protests at its size. The Thames Path meandered confusingly again, through a forbidding iron gateway and up a strange flight of outdoor stairs at the rear of Waterman's Park - an apparently abandoned 1970s office complex which felt like a set from a TV show. I expected to be chased along the raised brick gangway by Denis Waterman at any moment. Eventually though, I found my way through to the park proper - a sliver of green which runs along the Thames, the site of the former Brentford Gasworks which closed in 1963. 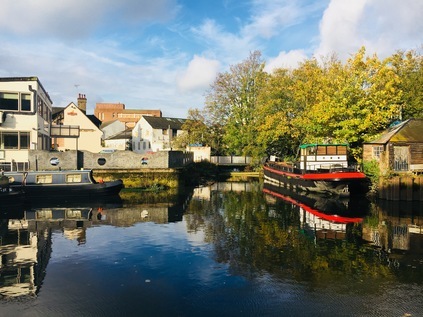 A busy arts centre now occupies part of the cleansed and remediated land, and the river moorings are contested territory - longstanding residents forced out to accommodate luxury boats. Beside me the brown waters of London's river parted to sluggishly churn around Lot's Ait and Brentford Ait - a pair of wooded islets in the river. Up ahead, the tall tower of the former Grand Junction Waterworks Company loomed at Kew Bridge, marking the point where my South Circular walk had returned me to the north bank of the river. This dogged but doomed company had tried in vain to extract clean water from the Brent and the Colne, but resorted in the end to syphoning off the murk of the Thames and using the lofty standpipe tower as a means of filtering out the worst of the filth and detritus. Somehow, even when I least expected it, my walks formed connections and strengthened my sense of the city. My earlier walk along the northern reaches of the river had almost convinced me that these western tributaries would be frustrating to follow and wouldn't form substantial walks, but today had persuaded me otherwise. I waited for one of the trains which had passed over my head earlier to arrive at Kew Bridge and take me swiftly back to Waterloo while I pondered my eastern prejudices. It's true that having been engaged in other parts of the city had made me pine for points east, but if these western walks continued to produce these new and surprising insights into the fringes of the city, then I'd be back to walk more of them. At times during the previous month, the River Brent had felt like a millstone - unfinished work, an incomplete walk sitting on the ledger - but it had in fact been deceptive - a river much longer, swifter and deeper than I'd imagined, and a route surprisingly capable of capturing my imagination. I wasn't the first to be persuaded it seems, and it was interesting to ponder quite what our former Poet Laureate would have made of modern Brentford?